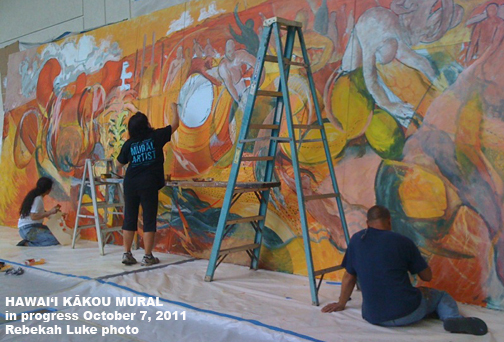 Native Hawaiian fine artists Harinani Orme, Meleanna Meyer, and Kahi Ching work on the "Hawaiʻi Loa Kū Like Kākou" mural at the Hawaii Convention Center. 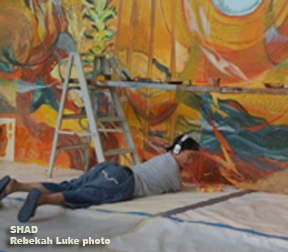 A mural painting in progress at the Hawaii Convention Center in Honolulu is something for the whole community to see and appreciate. Hurry on down. I watched the artists at work yesterday, intrigued with the program, the content, and the painting technique. 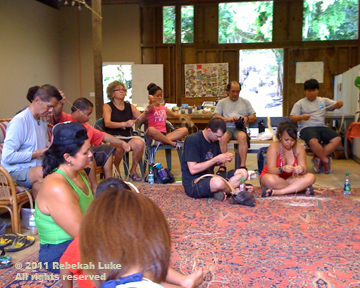 At this time five Native Hawaiian artists and kumu (teachers) — Kahi Ching, Solomon Enos, Al Lagunero, Meleanna Meyer, and Harinani Orme — and four alaka‘i (apprentice leaders) are working collectively on it following the ideas and insight from 22 haumana (students) of public, private, charter, and Hawaiian immersion schools and others. Many hands and hearts are touching this work. The mural consists of many layers of inspiration, thought, and paint. Shad Kaluhiwa, who has a disability, holds his paintbrush with this teeth. As the artists added the warm colors yesterday, and as I sat and continued to look at the painting, I kept seeing different things. The form of an ʻauamo (pole used to carry and balance burdens across the shoulders) was being visually turned. I noticed it curved, like the curvature of Earth, for then I saw the profile of continents and islands. From there, Earth images, sky images, plant images, people images, spheres, fish, line and dot. Intertwined and intriguing. Beguiling in a charming way. 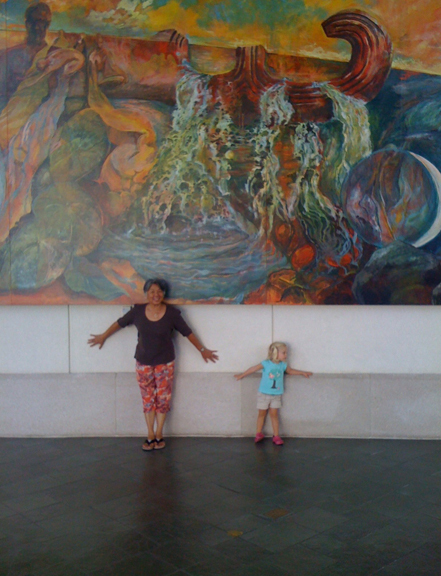 WHEN YOU GO: The mural painting is on the ground level underneath the escalators and next to the waterfall, through Oct. 11. It will be installed (I don’t know the exact location) Oct. 17-19, according to a printed fact sheet. Parking at the convention center costs $5 flat rate. 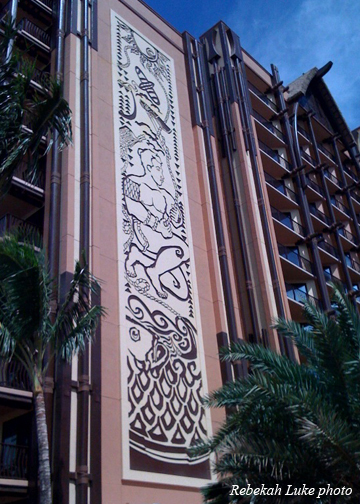 Congratulations to the “imagineers” of Aulani, the new Disney resort and spa in Leeward Oahu, for its Hawaiian theme, for doing the proper research, and for making art by Native Hawaiians so prominent in their design for this project. I took a ride out there today with my girlfriends, and we were impressed and grateful for what we saw. 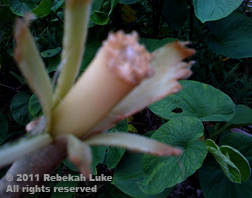 First off, we’re greeted by a lo‘i kalo (taro garden). There was an obvious collaboration among local artists that has resulted in the largest showcase of contemporary Native Hawaiian art. This accomplishment is huge. From BIG architectural elements to the smallest details in interior decoration, we were pleasantly surprised at the thought and creativity incorporated into the design. Kudos, also, of course, to the artists! I won’t tell you everything, and I’m not posting a lot of photos. I would rather you experience this venue yourself. Disney has managed to marry a family theme park with serious art and tasteful design. School’s out this week, and many Island families are “stay-cationing.” They’re really enjoying themselves. And it looks like Aulani becomes more magical at night with the Disney lighting effects. Our Native Hawaiian artist friend Harinani Orme designed this architectural panel and two others of different images for the exterior. This is what I mean by BIG! The ocean is right there, but there is so much to do within the hotel complex that you don’t notice it. It’s not the main attraction. Instead, guests can play with a sting ray, snorkel in a man-made reef pool, float around on a big inner tube, or frolic on the top of a man-made waterfall. I heard there’s a Menehune Adventure Trail that’s pretty cool to explore. Neat regular swimming pools, too. There weren't too many people on the beach or in the ocean, but it was a pretty view. When we got hungry for lunch we selected the ‘AMA‘AMA restaurant for its table service. 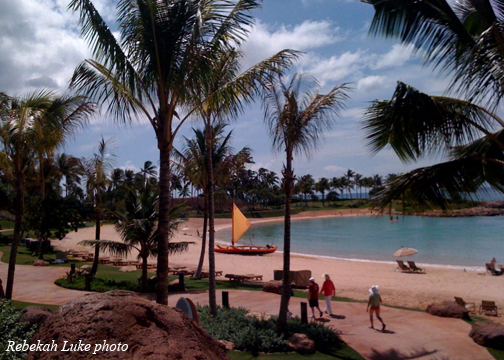 We were aware the daily newspaper did not give the eateries at the Aulani a very good review last week. The food critic thought the menu was unimaginative and the food so-so. But I lucked out. I ordered the “plate lunch” that was a chef special of the day, and here’s what I got! This "plate lunch" appeared on a tray like a Japanese kaiseki meal. 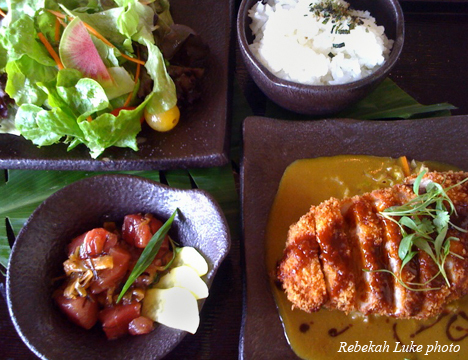 Fresh locally grown field greens, including slices of watermelon radish, poke (raw fish), pork tonkatsu with curry sauce, and perfectly steamed white rice. $16. My favorite place was Aunty’s Beach House, that is essentially a child care service. Aunty’s side is for ages 3 to 5 and was classic early childhood education curricula that I’m familiar with, and very well executed. Uncle’s side includes the “garage” for older children and provides activities, computer games, movies, etc. of interest to them. When we were there, Aunty and Uncle had just left. I could hear through a key hole something about washing the dog! 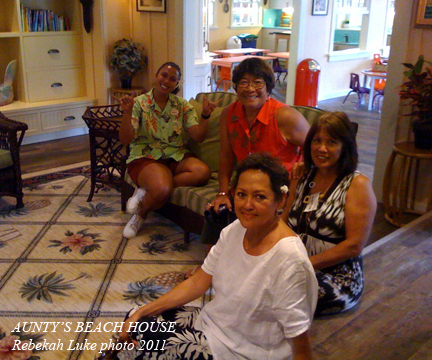 In Aunty's living room, "cast member" Kawena (in green shirt) talks story with my friends Pi‘i, Gene, and Moeata. Our tour was delightful. Hau cordage in the making. 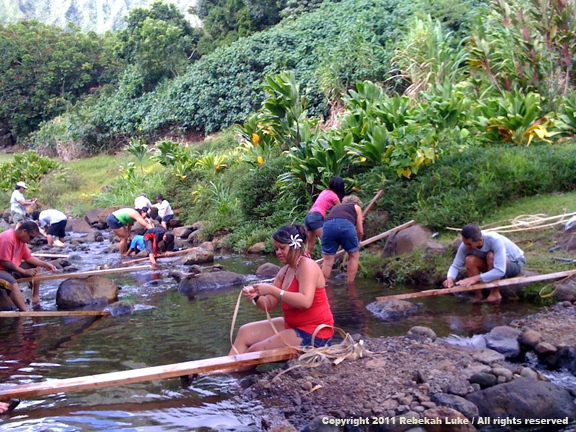 Hawaiians scrape to clean hau fiber by hand. 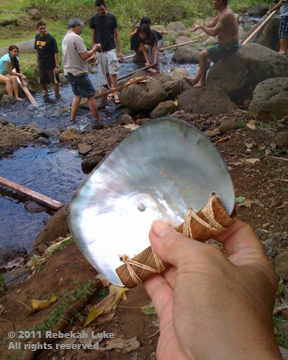 The foundation of native Hawaiian culture consists of the ability to fill three needs: containers to carry things like water and food, flaked stone for cutting, and cordage to fasten. These were necessary to build a Polynesian voyaging canoe that reached the Hawaiian Islands. 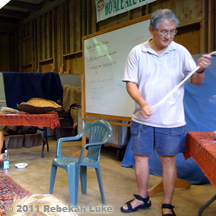 With that important bit of information, Ken Ching on Saturday showed a group of us the native Hawaiian way of making cordage from the bark of the hau tree (Hibiscus tiliaceus L.). 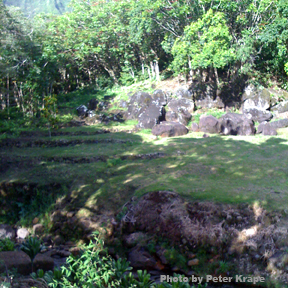 We gathered at Waipao, the site of Papahana Kuaola, on the banks of Haʻikū Stream on Oʻahu. 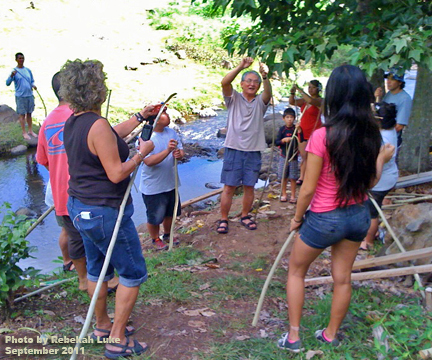 The Papahana Kuaola organization is all about involving the community in environmental restoration and economic sustainability, while integrating native Hawaiian knowledge. Its activities center on cultural and natural history. It’s wonderful, pono (right), and maika‘i (good)! Making cordage by hand is a way to learn about olden attitudes of living, said Ken. When one went for a walk, for example, it was to look for materials that were useful and could be appreciated. Here is my photo record of the day. 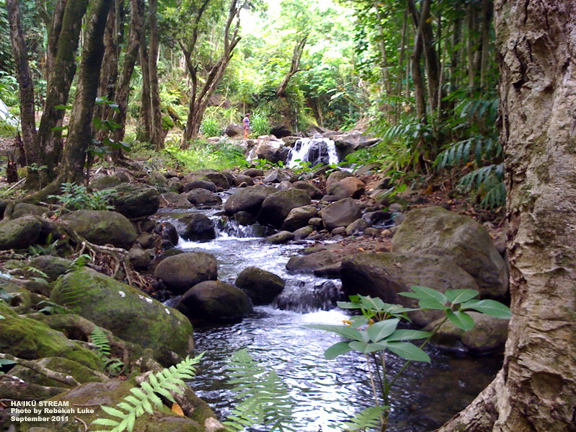 You can pretend you were there, or perhaps you would like to learn more about Papahana Kuaola from its website and visit there yourself. I came away with a little feeling of what it was like to live in olden times. I thought, maybe this is how it used to be and can still be if we live with Hawaiian values, learn from our kūpuna, and be thankful and kind to each other. I was happy for the people who are restoring the ʻāina (land) of Waipao. 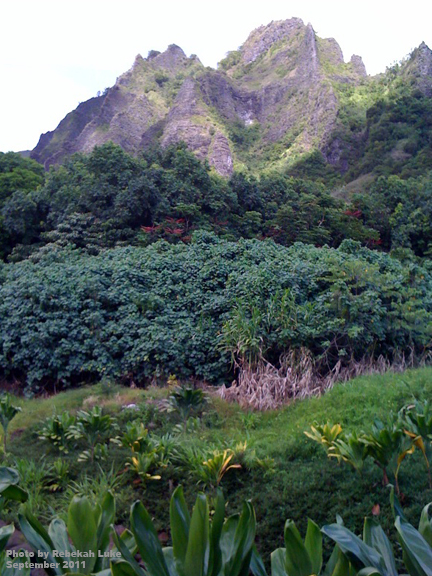 First are some images of this place, the ʻili (small land section) of Waipao in the ahupuaʻa (land division from the uplands to the sea) of Heʻeia, Oʻahu. 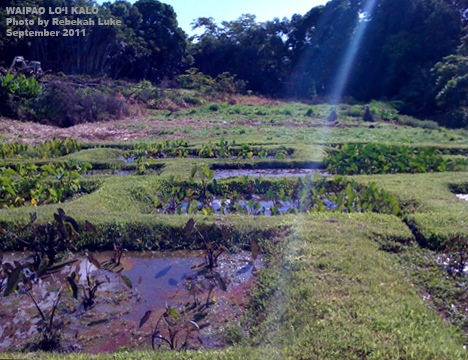 Loʻi kalo (taro gardens) in different growth stages. Notice more land being cleared in the distance. Lunch included a delicious stew made with foods grown at Waipao. The band of green across the equator of the photo is the hau thicket from where we gathered the raw material. 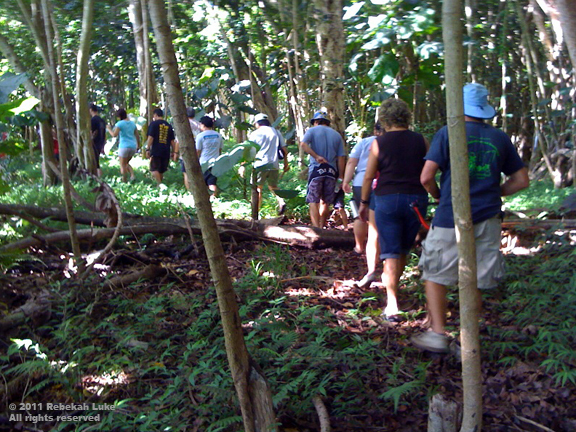 Into the forest we went to cut hau ʻili kea (young branches with light-colored bark). 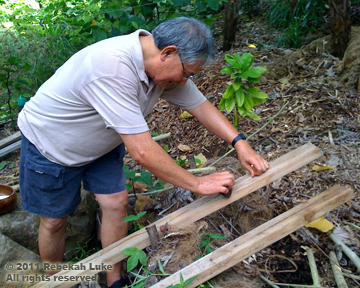 Our kumu Ken Ching demonstrates the right way and the less desirable way to pa‘e (strip) hau bark. Kahi the wale (scrape the slimey goo away). Ken sets the bark on a 2 x 4 and scapes it using long strokes from top to bottom, pressing hard. Fresh water, such as from a stream or city faucet, will result in a brown fiber. To preserve the whiteness of the fiber, use salt water to soften and wash away the wale (looks like mucus). Shell scraper to comb out the wale (slime goo) of the bark. 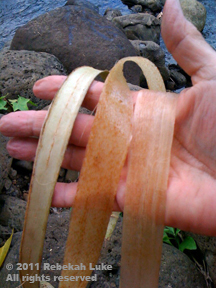 L to R: Improperly stripped hau bark; mid-way stage of scraping; still slimy and not white enough, i.e., there are more brown areas left to scrape out. Back indoors and after some lunch Ken showed us how to grade the fiber and twist it into cordage. Ken Ching with a bundle cleaned hau fiber ready for twisting into cordage. Separating the fiber and preparing to twist into cordage. Clue: You roll the fiber between your palm and your thigh with one hand, and twist with the other. It takes some practice. 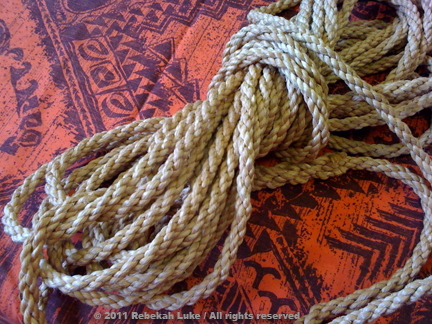 Kaʻalua na kaʻakolu: Our kumu Ken made this beautiful hau cordage. He made more like it for the double-hulled sailing canoe Hawaiʻiki. It was an honor to learn from a master. Some of my friends may know that I am a citizen of Ka Lahui Hawaii. I attended a working group meeting today to give a progress report on the new website http://kalahuihawaii.wordpress.com/ that I manage. It is even newer than Rebekah’s Studio. For weeks we’ve been figuring how best to install certain documents for the public, and from the response of citizens at today’s meeting we uploaded the “Constitution of Ka Lahui Hawaii.” I am so happy! And there will be more information to come. Looking back, quite a lot of nation building occurred in the 1990s. The citizens and honorary citizens were very active on all islands and on Moku Honu (North America). I remember attending legislative sessions throughout the islands: Kauai, Oahu, Molokai, Maui and Hawaii. There was an extensive sovereignty education program and citizens took stands on issues often. Many of our kupuna (Hawaiian elders) who guided the nation in the early years have passed over. Remembering the legacy they left us, we are now continuing to pick up the pieces and press onward. The Constitution, Master Plan, resolutions, work at the United Nations level, treaties with other nations, educational and economic programs, research—all done at a grassroots level. We met in churches, in parking lots, in parks, at community centers, at each others’ homes. Through the power of the internet, the Ka Lahui Hawaii working group is recording the nation’s efforts in cyberspace for current and future generations.